Exercise Talisman sabre 2013 will run between 15 July and 5 August. Graeme Dunstan and I will stand trial for the Rocky Tiger Ploughshares action sometime in the first half of 2013. We plan on using the trial to promote and support peace issues and focus attention on the way Australia is complicit in brutal US wars. There will be a federal election sometime in 2013, in which the Greens will advocate for immediate withdrawal of all our troops from Afghanistan. (Labor and LNP will keep special forces troops killing and dying in Afghanistan until 2024 at least). 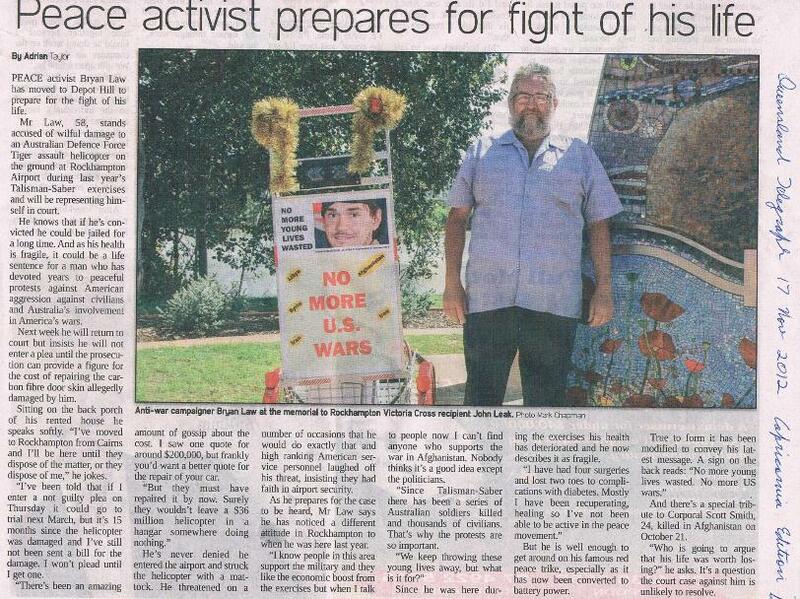 These pages will cover a range of preparations and activities for my 2013 peace campaigning in Rockhampton and districts.